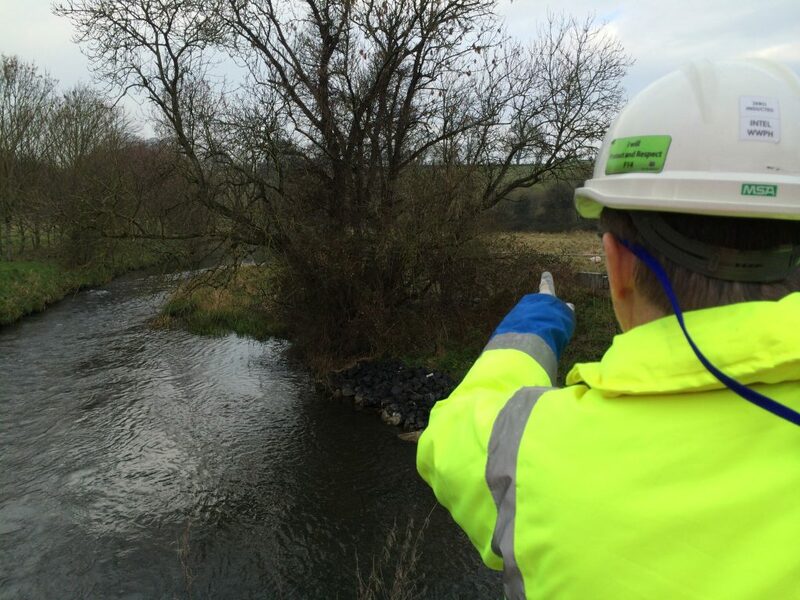 The North Leixlip Sewerage Scheme was a large undertaking for the Kildare County Council, but luckily they had engaged the Trenchless Experts to assist with the installation of new pipework. Terra Solutions first completed the Microtunnelling and Pipe Jacking sections of their contract, find those case studies here and here respectively. 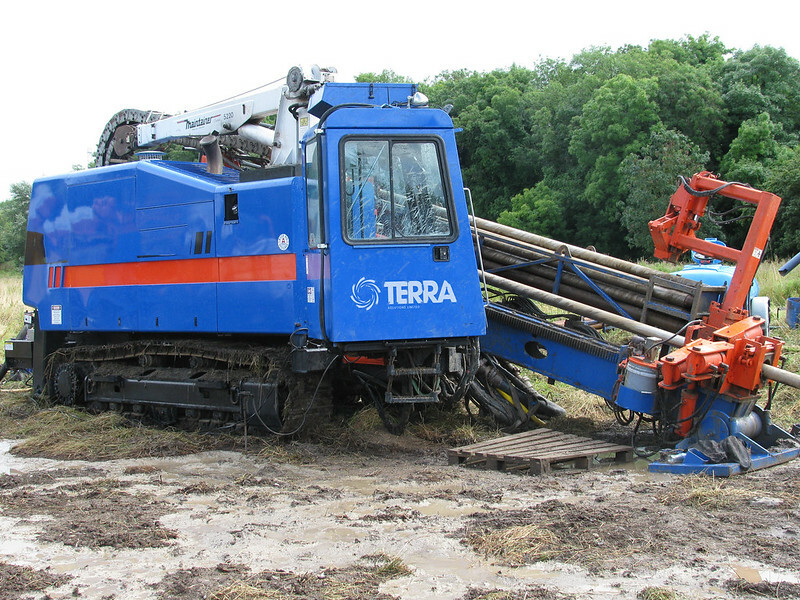 Having been contracted to utilise Trenchless Technology to install new pipework and maintain the existing network for the North Leixlip Sewerage Scheme, the final part of Terra Solutions’ project was the installation – through horizontal directional drilling- of a pipe 450mm in diameter that would serve as a rising main. This would prove to be a challenge, as the pipe had to bend and pass under the environmentally protected Rye River, and it was unclear from tests whether or not there was a bed of rock underneath the river that would have to be drilled through. A high pressure gas main (with a predetermined wayleave) was present at site creating another potential obstacle for the Terra team. Various plants & foliage at site also came under environmental protection statutes, meaning that the surface operation had to be carefully controlled. After a thorough site survey and ensuring that the HDD rig was suitably anchored with sunken rolled steel joists, the ancillary equipment could be attached and secured into place, powering the rig. With some adjustment, the appropriate ground entry angle was achieved. Utilising an optical gyroscope- which works by gathering data on a laser shined through a long stretch of fibre optic cable- the steering system for the pilot drill was put in place. By using an optical gyroscope we negated the need for surface wire grids and also protected against any magnetic interference. Then, the pilot hole was drilled using a sealed bearing Tricone drill bit. The drill pipes were then put into position on the drilling rig. Drilling fluid was pumped through the centre of the drill pipe to drive the motor and provide a hydraulic cutting action. The purpose of the mud jets is to lubricate the hole and remove the cuttings. Following the extraction of the pilot string a forward reaming hole opener was connected and forward reaming commenced. In this instance, Clearbore was utilised as our drilling fluid/lubricant instead of the industry standard bentonite due to its environmentally safe non-toxic properties. This was key underneath the salmonoid Rye River. After punch out at the destination the hole opener was removed from the rest of the apparatus and replaced with a reamer, swivel and eye pad. The pipe, which had been welded together according to the drawings was now attached to the swivel. One of the most delicate parts of the HDD process is the pipe pullback, but Tera Solutions approached this with the care that it required and coordination between the pipeside engineer and drill operator was made a priority. This was facilitated by both audio and video communication. The sections of the drill pipe were removed as they became free and once the pullback was completed the pipe was ready for connection. Terra Solutions completed the HDD section of their contract in much the same manner as the microtunnelling and pipe jacking sections- to a very high degree of accuracy as demanded by the client. Find our other Horizontal Directional Drilling projects here.